When a disease that is spread by cockroaches plagues New York City and kills scores of children, entomologist Dr. Susan Tyler develops a new species of bug, a predator with the ability to wipe them all out. Unfortunately, the solution may turn out to be worse than the problem. Nature versus science is a common theme in cinema. In Guillermo del Toro's second feature-length film, he tackles that very subject with a heaping helping of fantasy and sci-fi horror to go along with it. 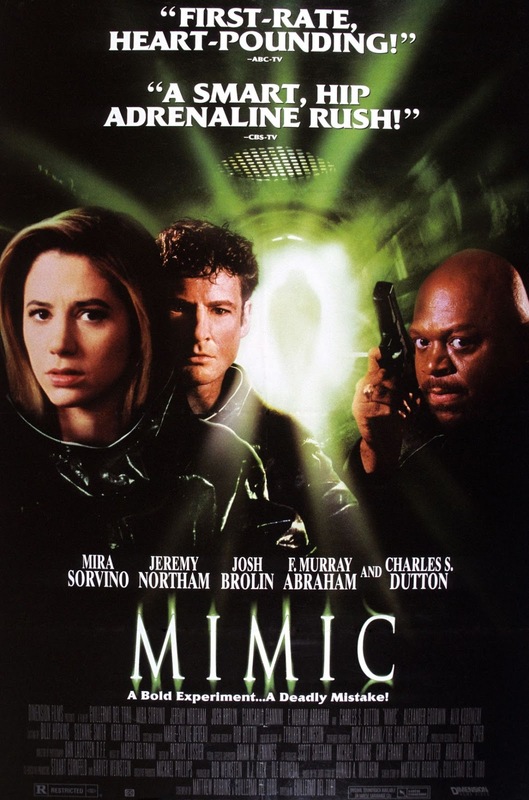 "Mimic" opens with the children of New York City dying from a strange virus that is spread by cockroaches, and as you may or may not know, New York has no shortage of cockroaches. In response, the CDC has entomologist Dr. Susan Tyler, played by Mira Sorvino, develop a new species of bug she calls the "Judas Breed." These Judas bugs are developed to kill off the cockroach population, which will, in turn, kill the disease. They were bred to be sterile, but as we all learned from "Jurassic Park," "life, uh, finds a way." When the Judas bugs start to breed, it may turn out that the solution Susan created is far worse than the problem it was meant to solve. Every director has their stumble, and "Mimic" is Guillermo del Toro's. This is not to say the film is a complete lost cause, but it is by far the most generic, formulaic film in del Toro's filmography. There are some good elements to like here, namely the effects work and creature design of the fully evolved Judas Breed bugs. There are a lot of neat and gross looking slimy creepy-crawlies all over the place that work well in the context of the film. Not all of the visuals in this movie are practically made. Del Toro used a lot of computer-generated effects as well which, at the time, were probably state of the art. In 2017, however, these effects are remarkably dated and look terrible. One of the other biggest downfalls of "Mimic" is the acting. It isn't good at all. Mira Sorvino's main purpose in the film is to deliver exposition and not much else despite the fact that her character is a freakin' doctor. Most the acts of heroism get passed on to Jeremy Northam's Dr. Mann, who works for the CDC. All of the other characters are simply there to be victims, to be killed off, or to serve as objects to be rescued. Outside of the intriguing general concept and the design of the creatures which can be cool looking at times, "Mimic" is probably one of the least del Toro-like films on his resume, which may be one of the reasons he has disowned the film. It is blatantly obvious studio intervention took its toll on the final product of this film. The characters and story aren't fleshed out enough, and we know from del Toro's other works that these are strong points of his. We have to wonder if his later director's cut helped improve these issues, but even still, we can't recommend this movie. I have always liked this movie and never understood why people railed against it yet they applaud stuff like Fast and Furious or transformers. Thanks for visiting our review site! We wish we had liked "Mimic" a lot more, and with the exception of one Fast & Furious movie, we totally agree with you. It is hard to see bad movies making millions of dollars while our smaller favorites are relatively left in the lurch. We're so glad you enjoyed this one!